The iconic Windproof Lighter reading "F**K COMMUNISM" given by The Duke himself, John Wayne, to Jesse's father in Vietnam, circa 1969. The lighter does bear the full, uncensored slogan however I have edited the photo in order to comply with Etsy's regulations. 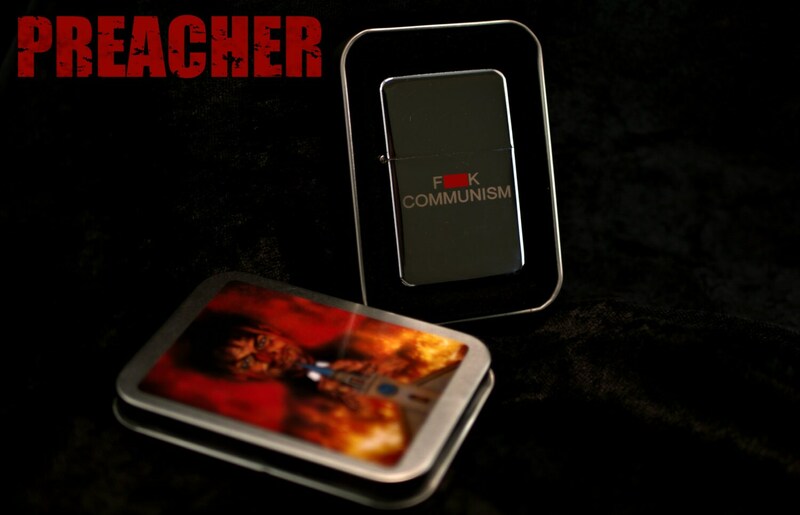 Comes complete and resplendent in metal carry case, bearing the depiction of Jesse's brazen grin with hands joined above a burning chapel from the cover of Preacher #1. The lighter itself is manufactured by STAR and comes with a lifetime guarantee. In line with the law it will be shipped without fuel, but it's so easy to fill yourself. A fantastic piece of comic book memorabilia and a great idea for a gift to fans of Preacher or any collector of comic book memorabilia! I am happy to ship anywhere in the world if the postage is covered, but I will ship to the UK for FREE! Please note: If am shipping to you outside UK then the item will take longer to arrive. Works great, looks great, arrived in perfect condition. Thank you! Super nice and very helpful. Thanks so much!